Obviously, any author is influenced by what he has read; even forty years ago T. S. Eliot knew that he was perpetuating a cliché in saying so, but in the case of such eclectic writers as Pound and Eliot and Joyce, this axiom is supremely true. They are concerned not merely with the general ideas and techniques of their predecessors, but with their very lines and words, which they reconstruct in a new mosaic of verbal power. To paraphrase a contemporary critic, “Immature artists borrow; mature artists steal”; and Joyce was a mature artist. The statement credited to Metalious did appear as the beginning line of her blockbuster novel Peyton Place in 1956 though the punctuation and capitalization were different. Chandler did write the words above in a comical letter in 1951. 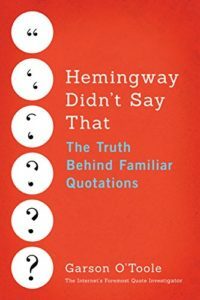 QI does not know whether the prominent literary critic Trilling made the statement above, but its appearance in Esquire catalyzed its wide dissemination with the attached ascription. There is probably more truth than we care to admit in William Faulkner’s observation that, “immature artists copy, great artists steal.” Knowing what and when to steal is very much a part of the designer’s self-education. The immature poet imitates; the mature poet plagiarizes. He headed the team that developed the Macintosh. Steve Jobs said that while it was being developed he kept in mind a quote from Pablo Picasso. In conclusion, in 1892 an important precursor of this family of expressions was published. The author was W. H. Davenport Adams, and his words may have influenced the version that T. S. Eliot published in 1920. Both writers referenced “poets”, but by 1959 a version with “artists” was in circulation. The expression continued to metamorphose and instances were attributed to major artists such as Igor Stravinsky, William Faulkner, and Pablo Picasso. The attachment to Stravinsky depends on the credibility of Yates. QI has not yet located substantive evidence for the attribution to Picasso.